Let me start with this…. 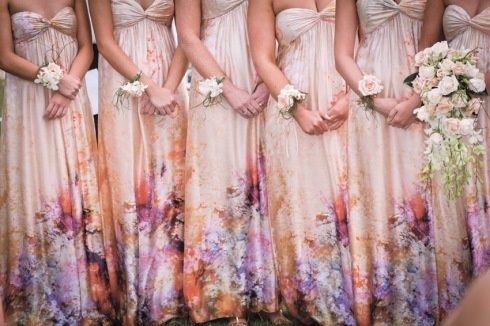 Getting married in the winter or just love all things glam? 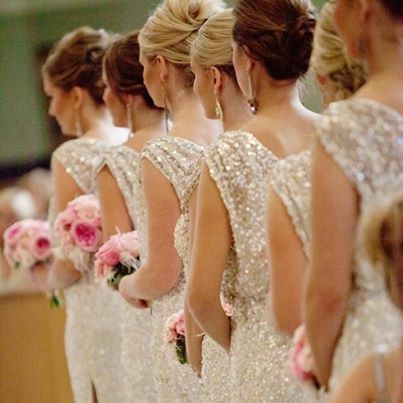 Put your girls in some sparkle, they look FABULOUS…and why wouldn’t you want fabulous people surrounding you on your big day!? Another subtle idea is to keep them in the same (albeit fashionable) dresses and change up certain parts of their wardrobe….shoes, jewelry, or even stockings! OR do the opposite and put them in completely different dresses but have one unifying element…like flowers, pattern, shoes, or jewelry! And now, just to show that i’m not completely unrealistic, I can agree to the same dress throughout the bridal party on some occasions. They have to be super fun and/or super fashionable. Here are some examples. Now, remember that just because the dresses don’t need to match, you’re still going to have to have the girls adhere to some sort of rule so they don’t get too carried away. The unifying elements are key!! !